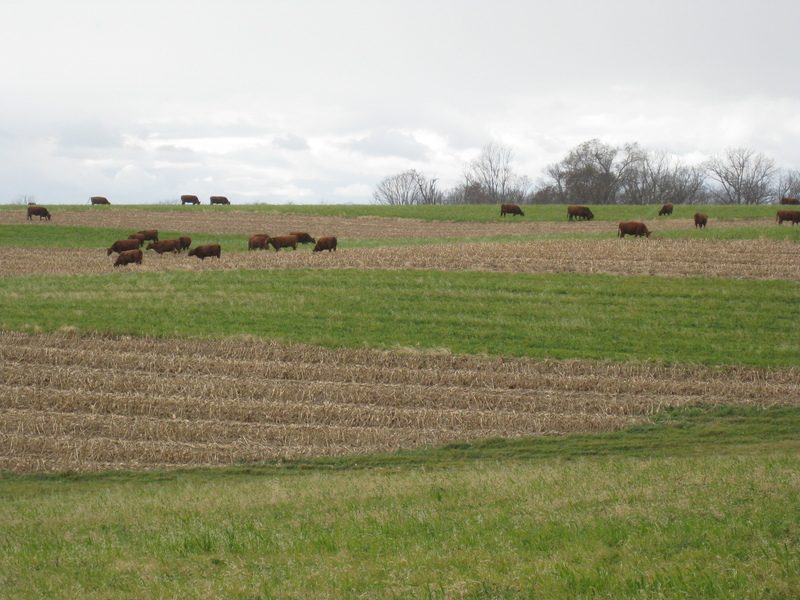 Cows harvesting the standing hay and cornstalks on my contour strips. Here is a picture taken right before corn harvest. The cows above are the ones the vet. confirmed pregnant when we pregnancy checked at the end of October. I wrote about my expectations, and the problems we faced this breeding season. 90% of the cows and heifers ended up being bred with a 60 day breeding season for the cows, and a 45 day breeding season for the heifers. 10% open is normal for us and acceptable. 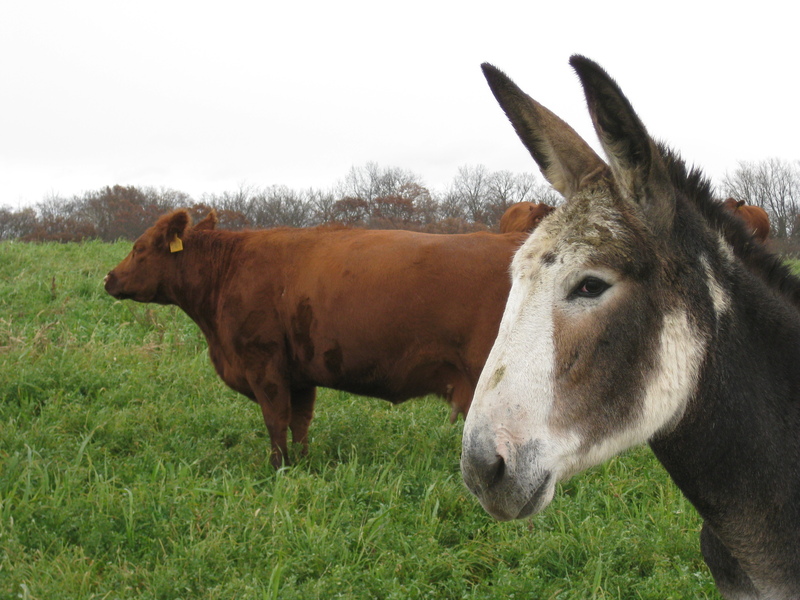 We have an excellent market for hamburger, so the cows that didn’t breed end up as beef. We have appointments with our butcher over the next month. Below is a cow which didn’t breed, and Wilma, of course. The open cows are grazing one of our best remaining pastures. I was thinking about the life they lead. I think it’s pretty good. They get to be in a herd of peers, eating quality forage, moving weekly, breeding, raising young. Up until the bolt-gun shatters their brain, it’s not a bad life. We took the boys to a city-wide Halloween party. A friend gave me the low-down on the best place to go trick-or-treating: the manor, or old-folks-home. The residents are seated in a semi-circle, each holding a bucket of candy. It’s funny, because whatever aversion a child has to old people is overcome by the lure of easy candy. I don’t know what kind of life each person has had, but the ending can be difficult. We all want to live a good life and die in our sleep. This entry was posted on Saturday, November 6th, 2010 at 8:40 pm and is filed under Curious cattle, Curious crops. You can follow any responses to this entry through the RSS 2.0 feed. You can leave a response, or trackback from your own site. This pic is interesting, compositiionally. And the post gave me a lot to think about, as my MIL has several chronic health issues. Thanks, WSB! I always appreciate your comments. My friend’s Mom is in the manor suffering from Alzheimer’s. It’s sad. Curiousfarmer on Spring Seeding and Disc Golf! Dave Perozzi on Spring Seeding and Disc Golf!